Soften butter using mixer then add sugar and egg (one at a time). Add flour, baking powder, baking soda, vanilla extract and cinnamon powder. Pour in oatmeal and mix until well blended. Add raisins and chocolate chips and fold. Scoop about a tablespoon of the mixture, form into balls then flatten. Put in a greased baking pan (other option: line the pan with cookie sheets). Baked for about 10-15 minutes or until golden brown. Remove from oven and cool before removing from pan. You can use dark brown sugar to add more color on your finished product. If you want to make your cookies chewy inside, lessen the cooking time. I will tell my daughter about your recipe. 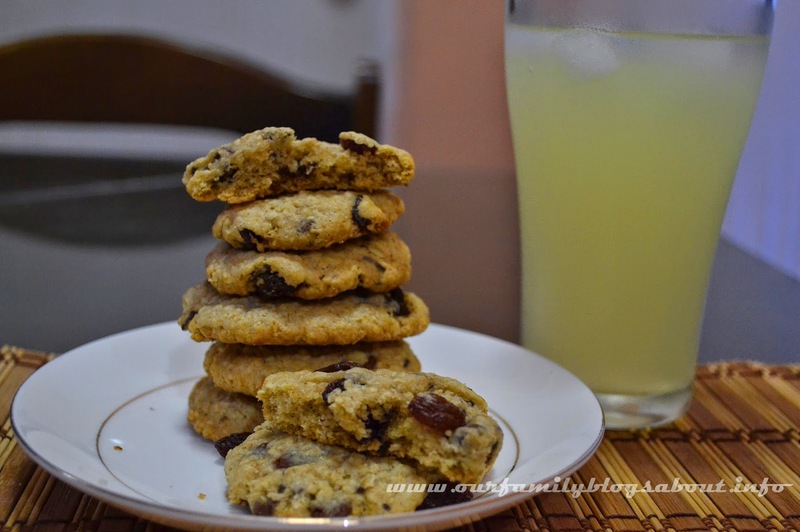 She wants to make chocolate chip cookies and this is even better and healthier because of the added oats. I remember doing something like this years ago but haven't had much time to bake lately. Looks so yummy! What kind of mixer do you have at home? That's a really yummy flavour. My kids love chococlate chip and raisin cookies too. thanks for sharing, would probably try your recipe next week! Matt is so lucky to have a Daddy like you who is not only a very loving Dad but a great cook! I miss baking. dO you make cupcakes too?